The Chapter Centennial Legacy Award celebrates ACP's centennial by recognizing one influential chapter member who served the chapter and made a significant impact on the chapter's viability. The award winner should exemplify ACP's core values, including leadership, excellence, respect, compassion, professionalism, and responsibility. William Rojas, MD, MACP is a well-known research, medical education and clinical practice doctor in Colombia. 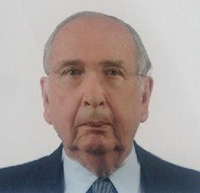 He played a big role in development of relationships between ACP and internal medicine physicians in Colombia, as well as the Colombian Association of Internal Medicine. Dr. Rojas is the general editor of Fundamentos de Medicina (Foundations of Medicine), the author of texto de Inmunología (textbook of immunology), and an active researcher in the field of malaria. He also is the dean of the School of Medicine, and the president of the University of Antioquia.